Products in this post were provided to me for the purpose of this manicure. This manicure was inspired by an iPhone 5 case from Cellairis. The base for this manicure is Fit For A Prince from Pomegranate Lacquer's Royal Fairy Tale Collection. For the rhinestones, I used a wheel from eBay as well as the round rhinestone wheel from MASH. The base and top coat used is LVX's 3-in-1 Treatment. To easily pick up and place the rhinestones, as you can see in the video, I used a wax pen from BornPrettyStore. Gorgeous, I love the color and the rhinestones look amazing! 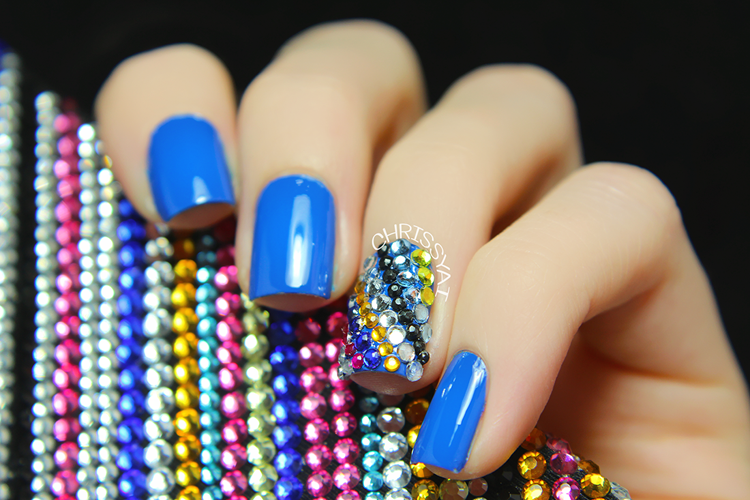 I am in love with that bling nail! Woah, blingtastic! And that blue ♥.